Little Crifts Cottage has been architect-designed and built specifically with holiday use in mind – we have done our best to ensure it has everything you could need in a place to stay, whether you’re looking for somewhere to get a great, comfortable night’s sleep in between busy active days, or planning to settle in, relax and enjoy the peace and seclusion of this beautiful corner of North Cornwall. The cottage is located on the edge of Bodmin Moor on a working smallholding, neighbouring our farmhouse. 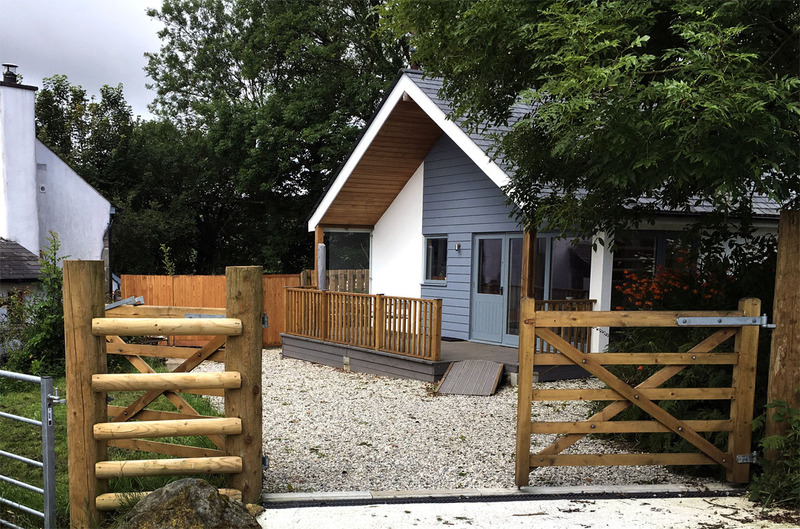 Two bedrooms, sleeps 4 (as two super-kingsize bedrooms, or one super-kingsize and one twin bedroom). Stunning open plan living area with cathedral roof and exposed beams, a large glazed corner for maximum natural light, natural slate floors and underfloor heating. Fully equipped fitted kitchen – we love to cook, if you do too then we hope you’ll be delighted! Large decked veranda equipped with table and chairs for outside dining & relaxing. Freestanding wood-burning stove for those chilly winter nights (or just because!). Dedicated use of fully fenced, large lawned garden / orchard. Families most welcome – but if you are travelling with small children, please see the ‘Quirks’ page for full details before booking. Single-storey layout, for maximum accessibility. Please see our Accessibility Statement for full details. Well behaved dogs welcome – please see the ‘Doghouse rules’ for full details. Bedlinen & towels included (but please bring your own beach towels). Washing machine, and folding Brabantia clothes airer on deck. Freeview TV & DVD player. The cottage is within easy walking distance of the excellent (and dog-friendly) Rising Sun Inn, with a well deserved reputation for its food and locally brewed real ales, located less than a mile along a quiet, almost level country lane. The A30 is only 10 minutes drive from the cottage, providing easy access to all destinations in Cornwall and the South West. The local village of Altarnun has a post office and small village shop. A full range of services (including town centre shops and banks, supermarkets, local hospitals and GP services, veterinary clinics, leisure centres etc) are located in the nearby towns of Launceston, Bodmin and Camelford, each about 20 minutes away. Bodmin Parkway railway station is about 20 minutes drive away, with local taxi services and car rentals available. Walk directly from the cottage and out on to the dramatic landscape of Bodmin Moor (local OS maps and walking guides are provided). North Cornwall is becoming increasingly famous for its ‘foodie’ delights – and there are many wonderful producers and places to eat in the surrounding area. Jamie Oliver’s ‘Fifteen’ Restaurant which enjoys panoramic views across Watergate Bay near Newquay, Rick Stein’s justifiably famous Seafood Restaurant at Padstow, and Nathan Outlaw’s quirky little Fish Kitchen by the slipway in Port Isaac are just a few personal favourites of ours. Further afield, the cities of Exeter, Truro, and Plymouth, with their full range of retail, entertainment, and cultural offerings, are each about an hour away. Little Crifts Cottage is located on the edge of Bodmin Moor, about three miles from the village of Altarnun. If you have any specific needs or requirements, or would just like more information about the facilities at Little Crifts Cottage, please don’t hesitate to drop an email to info@littlecriftscottage.co.uk and we will get back to you as soon as we can! Ready to book? Just head over to Prices & Availability, choose the week you’d prefer, and get in touch via the contact form there, or directly via email to info@littlecriftscottage.co.uk. We look forward to welcoming you to Little Crifts Cottage very soon!